It’s that time of year again. 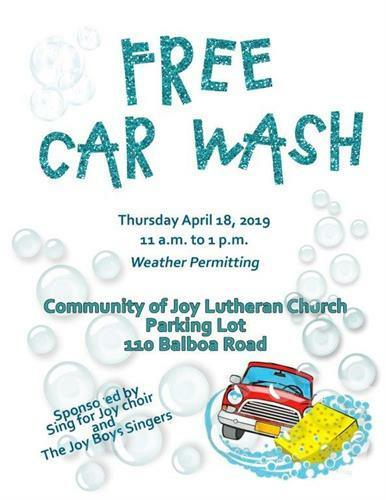 The Sing for Joy Choir and the Joy Boys Singers will once again be washing cars for free on Maundy Thursday, April 18th from 11 am to 1 pm (weather permitting). This is our way of illustrating the way Jesus washed the feet of his disciples who walked everywhere. Since we use cars today as our major mode of transportation, it is only appropriate to wash our cars! Come to Community of Joy Lutheran Church, 110 Balboa Rd. to have your car washed. While you're at it, tell your friends to come and have their car washed, too!